Toshiba L50-B-1N8 15.6 inch White laptop 4th Gen. Core i3-4005U 8 GB RAM 1TB HDD. Pictures for illustration purposes only. Colour White Only. 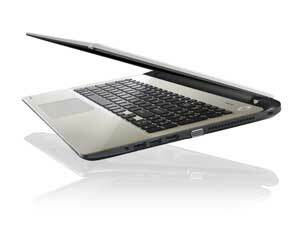 Toshiba L50 is equipped with all those features which will give you a best work and entertainment experience. With its slim and light design you can take it everywhere with you. With its wide connectivity options you can easily connect to the world around you. 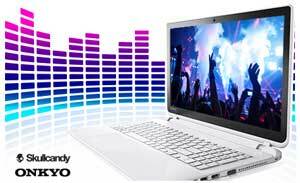 Its 15.6 display and amazing graphics and sound lets you enjoy your multimedia to its peak. L50-B's 15.6-inch display and choice of integrated Intel HD graphics*, or external AMD Radeon R series graphics take your viewing experience to the next level. Now you can watch pictures, videos or other content in clear graphics on its HD scree. 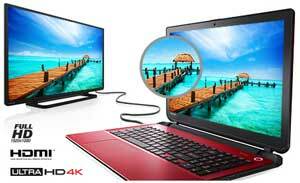 On selected models you can watch Ultra HD 4K content stored on your laptop on an Ultra HD capable TV by using HDMI port. This port allows you to connect your Laptop with TV and projectors. To ensure high picture quality Toshiba L50 comes with built in Resolution+ technology. It enhance the quality of our video and pictures in real time.